Lamp this: The Viper & His Famous Orchestra will be calling Madison, Wisconsin their viper’s nest this summer, with three (free & outdoor) shows at Mickey’s Tavern and an Adult Swim: Summer Speakeasy show at the Madison Children’s Museum. Look for The Viper & His Famous Orchestra in Madison this summer of ’14. 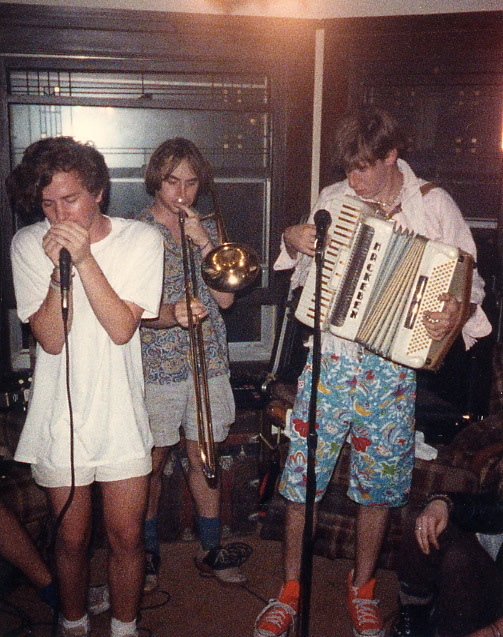 Here’s a younger Viper playing trombone with My Cousin Kenny: David Koller sings, John Papageorge plays accordion, and Joel Mark (out of frame) plays guitar. We were playing what would not yet have been known as a “house show” in the apartment of (I believe) Kathy Rathke on E. Gorham, or E. Johnson, or E. Gilman, or something like that. The first of the Mickey’s Tavern shows happens this upcoming Monday, July 14, from 5:30-7:30 p.m. That’s Bastille Day, you know. So we’ll plan on opening up some prison doors — mental and physical, but mostly mental — during our two sets. And did I mention it’s free? And outdoors on the patio? The Viper has a lot of fond memories of summers in Madison, where I played in a number of bands as an undergradate (Phlegm, Enzymatic Fly Vomit, My Cousin Kenny, Kissyfish, The Beatles, Gentlemen Prefer Hank), and where I first honed my ukulele chops on various corners along State Street… to the consternation of my many unwitting serenade victims. My usual practice was to busk until I’d earned enough to subsidize an evening of pitchers, burgers, Tetris, and “Beat on the Brat” on the jukebox at The Plaza Tavern. So if you can’t catch us at Mickey’s or the Adult Swim, look for us near The Towers, if we can jostle Art Paul Schlosser out of the way. 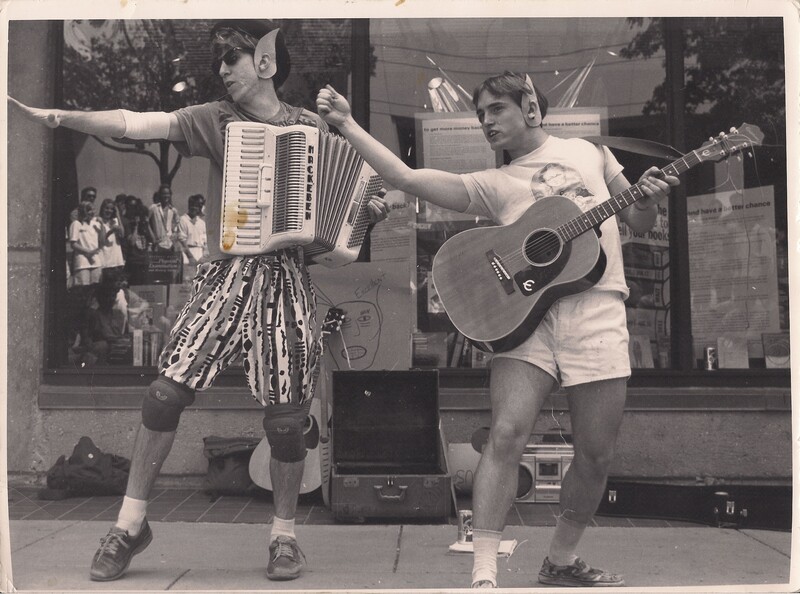 Viper the Younger (Ryan Jerving, right) plays with John Papageorge at the foot of State Street, between the University bookstore/Christian Science reading room and the UW main Library. I think we’re singing Duran Duran’s “Wild Boys” here. The boombox in the back stands at the ready for our rap numbers.